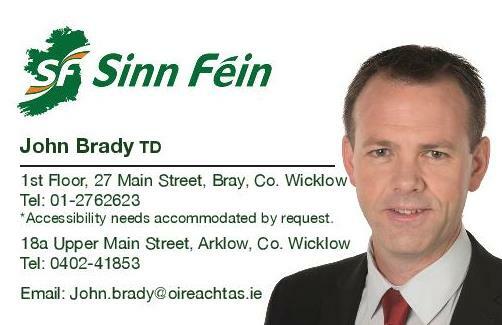 Sinn Féin TD for Wicklow and East Carlow John Brady TD has criticised the motives behind prioritising the reopening of Stepaside Garda Station, above all other stations recommended for reopening in a new Garda interim report. While, this report talks about the reopening of Garda stations in Rush, Donard and Leighlinbridge in County Carlow, Stepaside is the only Garda station to have been approved by Cabinet to progress. “It is a pretty damning indictment of Irish politics when the reopening of a Garda station is gifted to a Senior Minister as a trade off for a quiet life for the Taoiseach, when it comes to the appointment of Máire Whelan to the Court of Appeal. “Minister Ross has been content to spout utter outrage at political interference in judicial appointments that is, until there is something of benefit in it for him. “Recent years have seen an increase in rural crime and the closure of over 130 Garda stations nationwide thanks to Fine Gael and Labour has been a major factor in this. “The closure of Donard Garda station, something which I strongly opposed along with my party at the time, has left a blackspot in West Wicklow. The need for a Garda station to protect this community is the exact same need of that in Stepaside – there is no hierarchy of need. “The reopening of Garda stations should be based on community need alone. It should be about protecting people in communities where that protection has been removed and taken away particularly, in rural areas.